In celebration of a new year, I have a really awesome giveaway for you today... A brand new journal for jotting down your creative ideas. A new journal is like a new year... a fresh start. But this is not just any journal. This is a Vintage Vinyl Journal, and it is gorgeous! Katie Pietrak left the corporate world to launch Vintage Vinyl Journals last spring. 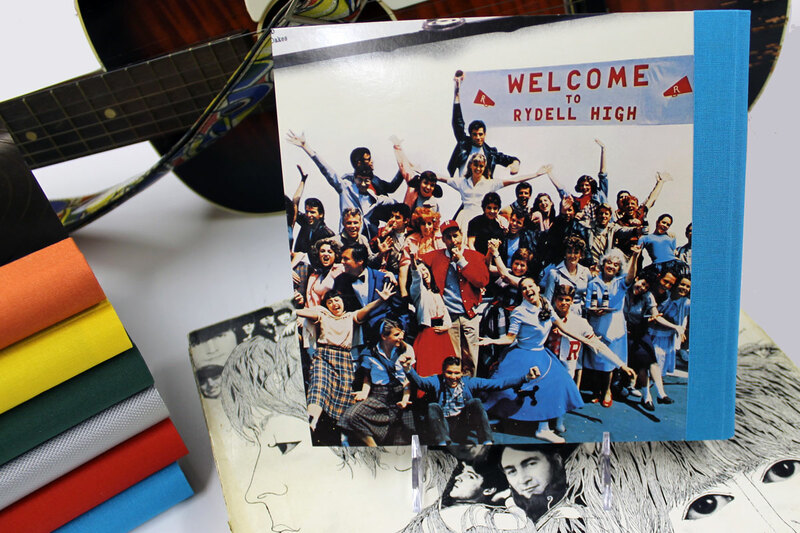 On her website, she says, "We rescued the forgotten vinyl record and lovingly crafted a one-of-a-kind blank writing notebook for those who appreciate a simpler time – when albums started with a pop and a hiss as needle met groove and thoughts were recorded pen to paper." Don't you just love that sound? 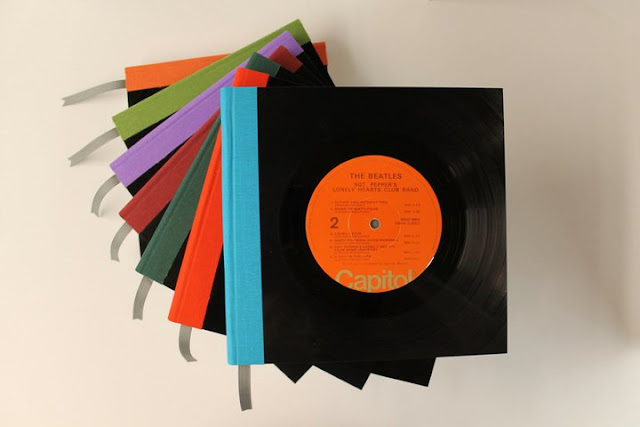 Every journal features a recycled vintage album – the original vinyl album on the front and the album cover art on the back. 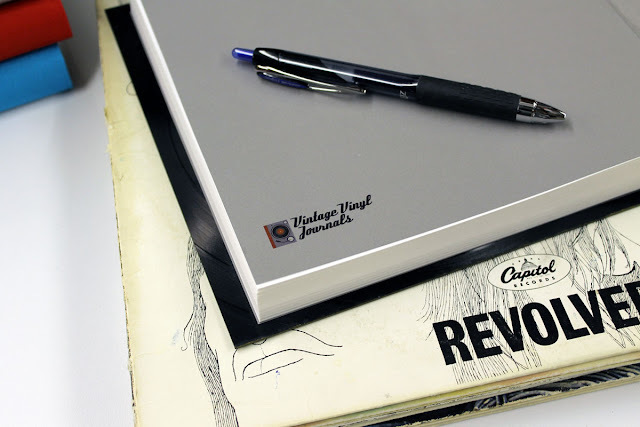 These journals are eco-friendly and handcrafted in the USA from recycled materials and 100% acid-free paper. Each journal contains 240 high quality unlined pages. 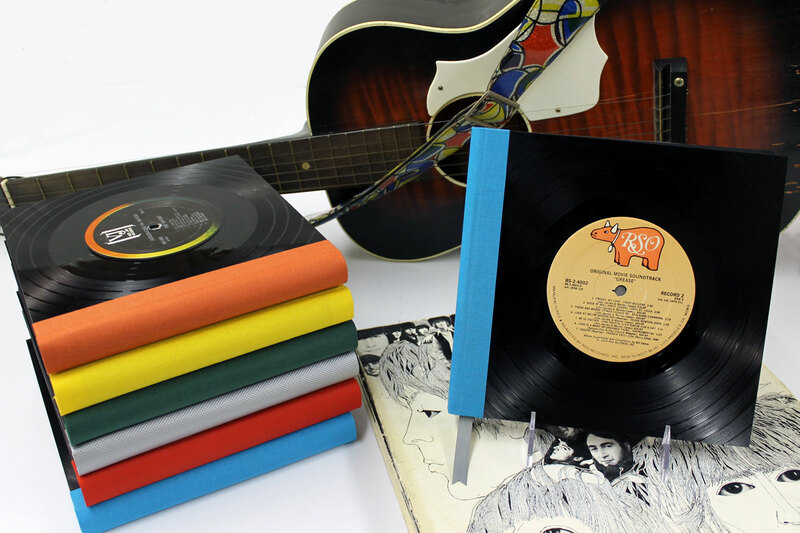 These journals would make fantastic gifts for music lovers. Katie has a wide range of genres and artists available, so take a look for the perfect gift for someone in your life. Let's get down to business... Katie is generously giving away one of her beautiful Vintage Vinyl Journals today! And guess which one it is?!? "We go together like rama lama lama ke ding a de dinga a dong"... Grease!!! I love that movie! Please note: No international entries for this giveaway. US residents only. Sorry! Visit Vintage Vinyl Journals, then come back here and leave one comment on this post telling me which journal is your favorite. 1. Sign up for the Vintage Vinyl Journals newsletter. Leave one additional comment on this post letting me know that you did. 2. "Like" Vintage Vinyl Journals on Facebook. Leave one additional comment on this post letting me know that you did. That's up to three entries per person. Make sure you either leave an email address in your comment or that your email is attached to your Blogger profile. If I don't have a way to get in touch with you, I will choose another winner. This giveaway will be open until 10:00pm (EST) on Monday, January 30th. The winner will be chosen using a random number generator. I will announce the winner on Tuesday, January 31st, and they will have until Friday, February 3rd at 7:00am (EST) to respond before I choose another winner. Thanks so much to Katie for this giveaway :) Good luck everyone! All photos in this post courtesy Vintage Vinyl Journals. i liked them on face book! Elton john or Eagles, so many chioces do i have choose just one? My mother in law would LOVE these! I followed the news letter too! I would love the Beatles Abbey Lane - such fond memories I have of the old vinyl records. I subscribed to the newletter. So many awesome albums to choose from! As a Disney fan, I was drawn to "Disney's Going Quacker's" Love me some Donald Duck! Love The Beatles Sgt. Pepper's Lonely Hearts Club Band!!! I would have chosen Pretty in Pink, but it is out of stock. For my son, the Muppet fanatic, I will say The Muppet Movie. What a neat product! I signed up for the newsletter - thanks for the extra chance to win. I would pick Alice Cooper - Greatest Hits. I have lots of memories listening to that with my dad. Simon and Garfunkel - Sounds of Silence. My high school sweetheart and his best friend became obsessed with them when I was a junior. Just the album name brought back a wave of good memories. I love the beach boys, so there best hits album would be perfect for me!! Thanks!! I really like the The Monkees - Then and Now... The Best Of journal. I love the idea of this. It is just amazing and blows my mind. Thanks for the chance to win one. I'd have to go with the West Side Story Soundtrack journal - love it!!! Pick ONE???? I don't know!!! I think maybe Annie? That's the first movie I remember seeing. I drove my parents crazy singing all those songs in my screechy voice, hahaha. What a nifty idea for old vinyl! I liked The Beatles on Abbey Lane! I "like"d Vintage Vinyl Journals on Facebook! These are ridiculously cool. I'm not sure anything can top the Grease one, except maybe Dirty Dancing! I like vintage journals on fb! I like The Beatles Love Songs journal. I can't believe they hacked up that record. Oh well. It looks cool! I signed up for the Vintage Vinyls newsletter. I liked Vintage Vinyls on Facebook. I love the Aerosmith - toys in the attic journal. I Boston bands and this one in particular. I was always oddly drawn to and terrified by the stuffed animals on the album cover too! I absolutely LOVE the movie GREASE!!! I know it backwards & forwards, even have my girls hooked! What a cool idea! Grease is a classic. I would also really like 101 Dalmations... I watched that movie a million times. Easy decision for me. I'll pick the Dirty Dancing one. Favorite movie of all time...don't judge. Almost everything I liked is sold out! But I'm going with Miles Davis and The Rose by Bette Middler coming out! AND I liked them on FB! I signed up for the Vintage Vinyl Journals newsletter. Thanx!! The Guns N Roses one is awesome, and I love the Little Shop of Horrors. How clever & cool! I'd love the Carpenters!! I love Frank Sinatra - My Way! Great upcycle idea! I remember my mom use to make flower pots out of her old records. My favorite . . . Michael Jackson's Bad album although the Prince journal would make an excellent birthday gift for my BFF. Mary Poppins or Phantom would be awesome. I have a sister whose birthday is coming up. This would be a great gift! I would get the Black Sabbath Paranoid for my head banging hubs! love love The Beatles Love Songs journal!! I love the movie Grease. But I also like the Billy Joel album. These journals look awesome! I like the Simon and Garfunkel album, sounds of Silence. I signed up for Vintage Vinyl Journal's newsletter. I like Vintage Vinyl Journal's FB page. This is really a creative idea and one that I've never heard of! I checked out the site and like The Sound of Music as my choice if I won! Thanks for the chance. I'd pick Purple Rain by Prince! I would pick Carly simon!! Joni Mitchell- Blue is my favorite! I like them on Facebook- Kylie Carlson. I would love to have the Adele 21 journal! I Signed up for the Vintage Vinyl Journals newsletter.